The two sides meet at Croke Park this weekend. 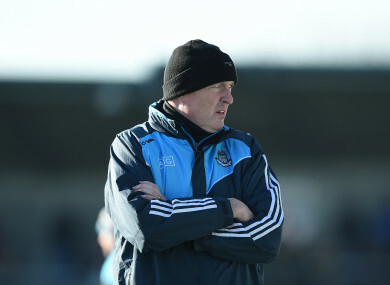 Dublin hurling manager Pat Gilroy. DUBLIN AND TIPPERARY have named their teams for Sunday’s refixed Allianz Hurling League quarter-final showdown at Croke Park, with both sides making two changes. Dublin eased their relegation play-off fears with victory over Laois a fortnight ago and in the process secured their place in the last eight, with Pat Gilroy naming a strong team for Sunday. James Madden comes in at wing-back for Johnny McCaffrey while in midfield Rian McBride replaces Cillian Costello in the two changes in personnel from the 3-23 to 0-17 victory over the O’Moore County men. After their opening game defeat to Offaly, Dublin have steadily improved as the campaign has progressed but face a stiff test in the shape of Tipperary at HQ this weekend. Michael Ryan has made two changes to his side from the one he named to play the original fixture last Sunday, with Paudie Feehan and John McGrath both starting. The game, which is part of a double-header with the football clash between Dublin and Monaghan, throws in at 1pm. Email “Dublin and Tipp make two changes apiece for Sunday's quarter-final showdown ”. Feedback on “Dublin and Tipp make two changes apiece for Sunday's quarter-final showdown ”.